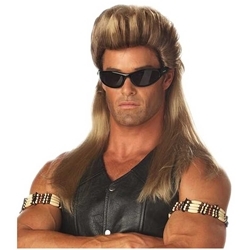 Dress as TV's favorite bail bondsman and bounty hunter this Halloween using the bail enforcer wig. Add a pair of studded leather gloves and handcuffs to help complete the look. The bail enforcer wig is colored as pictured. Wig is one size fits most using an elastic band on the inside of the wig.